Water is a critical natural resource for people, for food and for energy. Sustainable water management is a key to safeguard sufficient and clean water for different uses. Ongoing collaboration on water management is of great significance to both China and Europe to prevent future global water crises. As stated by the Joint statement, with the support of the EU Water Initiative (EUWI) and based on reciprocity and mutual benefit, CEWP was established to achieve the objectives of realising good governance in managing water resources and enhancing mutual understanding on approaches in integrated water resources policy development and implementation. Since the CEWP was introduced, four annual high-level dialogues have been held respectively in Zhengzhou, Budapest, Beijing and Copenhagen. The 2017 CEWP High-level Dialogue Conference was held in Turku, Finland with high-level representatives from 11 countries, EU, World Bank and OECD and ca. 400 delegates altogether. The Conference was concluded by Turku Declaration to promote China-EU communication on water resource management, green growth and circular economy policies and experience in a collective effort to expedite the fulfillment of the 2030 Agenda for Sustainable Development goal on water. 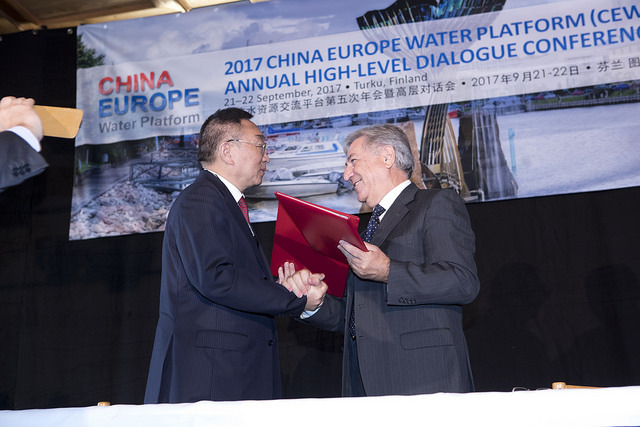 On top of that a Memorandum of Understanding about Water Policy Dialogue between China and the EU Commission was signed.